Successfully Added Ultimate Single DIN Car DVD with Touchscreen and Ipod Input to your Shopping Cart. The ultimate single DIN car DVD with touchscreen is here featuring all the features of some of it's bigger cousins without the larger real estate requirement. This head unit features a high power output of 4 x 50W as well as the expected pre-outs for further standalone amplification. An ipod connection cable is provided so you can route the cable from the rear of your unit into your glove box and connect the ipod from there. 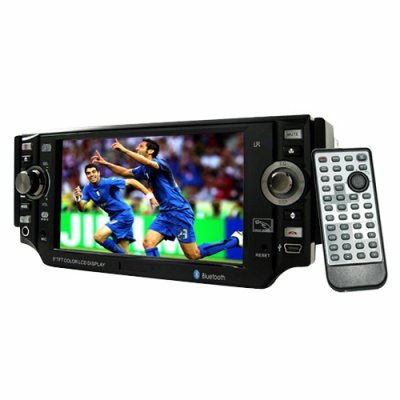 Bluetooth calling and answering is also possible with this unit as well as analog TV (where available) support, DIVX, Rear view camera input with auto switching, and USB-IN. When security is paramount you can simply remove the face plate and take it with you. A great fully featured unit offered at an even better wholesale price direct to you from Chinavasion, order now with no worries about M.O.Q. and with the confidence of our famous 12 month warranty. Vehicle DVD player with touchscreen control. IPOD and USB inputs for enjoying additional media options while on the road. The unit was delivered in 6 days to the United Kingdom. I've just installed the unit, it was very easy and its a snug fit there was no need to mess with the dash. The unit it's self is great and looks good. However I am unable to control my ipod from it but it does play the music from the ipod very clearly. So far i'm quite happy with the unit. this was my first item i have purchase,from chinavasion one yeas ago and still works today. very easy to use. all my friends love it. i recommand this web site to any one in the caribbean. I thought it necessary to give a review on this unit since I have been looking at this site for months, wary of making a purchase. Having received and installed this unit in my car I can say that I will buy with confidence from Chinavasion in the future. The unit itself has more options than you can sanely use, but it is nice to have options. I have had some issues being able to control an old ipod from the deck, but it plays loud and clear. the in car bluetooth reads from a mic on the faceplate; which leads to easy install and merely useable sound, but I do continue to use and enjoy the bluetooth feature. The install wires are the same colors as the factory or aftermarket, so it was an easy switch, although the harness was useless and I had to hard wire in. The unit is slightly larger than my previous stock, and the sides had to be cut away on my dash to fit the face. It had to be crammed in, but it works well and I have had no issues to date. you have to ground the parking wire to have the video work. It feels like a quality product and if it breaks I will update my review.